If you’re a new fan of M*A*S*H and have never seen “Goodbye, Farewell and Amen,” don’t read this review until you’ve had a chance to watch the series finale. Then return and share your thoughts. Capsule Summary: As the Korean War draws to a close, Sidney Freedman tries to help Hawkeye recover from a traumatic experience. Meanwhile, B.J. desperately tries to get home in time for his daughter’s second birthday. The rest of the 4077th wonders what life will be like once the war ends. It shouldn’t come as a surprise that I intentionally held off reviewing “Goodbye, Farewell and Amen” so it could be the very last episode to get the Episode Spotlight treatment. 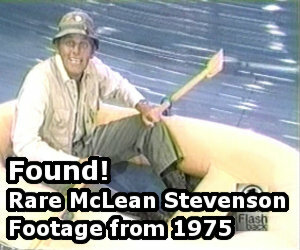 What better way to conclude my journey through all 251 episodes of M*A*S*H? My Episode Spotlight project started back in January 2013 and now, almost five years later, it’s over. Due to its length, “Goodbye, Farewell and Amen” is the episode of M*A*S*H I’ve seen the fewest number of times. I wasn’t alive when it originally aired. I’m pretty sure I watched for the first time in 1999 when it aired on cable channel FX, likely as part of a holiday marathon. I can clearly remember setting the VCR to record it. I watched it after school the next day. I’m almost positive I didn’t watch it again until 2007. That’s when I saw it uncut on DVD for the first time. I don’t recall watching it again after, at least until I rewatched it for this review. This is not a happy ending for M*A*S*H. True, the Korean War finally ends and the characters are able to return home or move to their next assignment. But they’ll never be able to leave Korea behind them. Not entirely. The scars run too deep. They’ve seen too much, experienced the horrors of war on a personal level. I’m okay with that. I don’t need a cheery farewell to the 4077th. But it’s too bad that one story line–a single scene, really–has overshadowed the final episode of M*A*S*H. The revelation that Hawkeye’s mental breakdown stems from having seen a Korean woman smother her own baby is shocking and horrifying. It’s also unforgettable. Hawkeye breaks down while talking with Sidney. In general, I don’t have a problem with Hawkeye suffering a breakdown in the series finale. The character does have a history of mental problems. See “Dr. Pierce and Mr. Hyde” from Season 2, “Hawk’s Nightmare” from Season 5, and “Bless You, Hawkeye” from Season 9. What doesn’t work for me is isolating Hawkeye from the rest of the cast for the first half of the episode. “Goodbye, Farewell and Amen” starts to pick up when Hawkeye returns to the 4077th. In my opinion, the second hour is stronger than the first. It’s no surprise so much time is devoted to Hawkeye but I do wish the episode had done a better job giving the other characters their due. Margaret in particular deserve more attention. She feuds with Charles and that’s about it. True, she ultimately decides to stop letting her father dictate her career, but this is barely explored. Klinger gets one of the happier endings, even if he doesn’t get to go home. He finds love, marries Soon-Lee, and decides to stay in Korea to search for her parents. It’s a fitting end for the character. I’m glad there’s a callback to his dress-wearing days. Colonel Potter also has a happy ending. After serving in three wars, he’s ready for retirement and to become Mrs. Potter’s Mr. Potter. Father Mulcahy losing his hearing is sad. The fact that his injury has him doubting his faith is devastating. Likewise, Charles leaving Korea no longer able to enjoy in his beloved classical music is deeply depressing. Watching him wave to the North Korean musicians as they’re carted off is sad. Charles waving goodbye to his musicians. It’s heartbreaking when he later learns the musicians have been killed. With the exceptions of Margaret and Colonel Potter, all of the characters require time for their story lines to unfold. Charles, for example, worries about getting a position at Boston General, runs into the North Korean POWs, takes refuge in his music, discovers the musicians can play Mozart (badly), tries to teach them to play a particular piece, watches them drive off in the back of a truck, and ultimately learns they were all killed when a shell hit their truck. He tries to seek comfort in music, but it no longer soothes him. The way the Hawkeye and B.J. story lines intertwine is well done. B.J. tries to say goodbye to Hawkeye in person, but can’t, then doesn’t have time to leave him a letter. Hawkeye, upon learning that B.J. is gone, bitterly recalls how Trapper also left without saying goodbye. Later, after B.J. has returned to Korea, he and Hawkeye have a talk about goodbyes and farewells in the Mess Tent. Their story lines culminate with the final scene of the episode, when Hawkeye spots B.J.’s message. The farewell dinner sequence is well done. It’s nice to see so many minor characters given the opportunity to share what they’ll be doing after the war ends. With few exceptions, everyone is cheerful and happy during the dinner. Not Nurse Bigelow. After two wars, she’s seen enough death. Clocking in at two-and-a-half hours with commercials, or two hours without, I believe “Goodbye, Farewell and Amen” is the longest series finale in television history. Does it drag at times? Yes, particularly during the first half whenever Hawkeye and Sidney are talking about Hawkeye’s breakdown. Are all the characters given the sendoff they deserve? Not quite. As I mentioned, Margaret isn’t given nearly as much of a final story line as the other characters. Ultimately, I’m satisfied with “Goodbye, Farewell and Amen” as the series finale to M*A*S*H. It’s not perfect, but it ends the war and gives the characters closure. More importantly, it offers viewers the opportunity to say goodbye to both the characters and the long-running sitcom. B.J. says GOODBYE to Hawkeye. A fire destroyed the outdoor M*A*S*H set at the Malibu Creek State Park on October 9th, 1982, requiring hasty rewrites to the script. Eight different writers, including two writing teams, had a hand in penning this episode. This is the only episode of M*A*S*H in which the episode title appears on screen. It’s also the only episode to feature guest star and production credits at the start of the episode. Some 105.9 million viewers watched “Goodbye, Farewell and Amen” during its original broadcast. For 27 years it held the record as the single most-watched television broadcast in U.S. history. Super Bowl XLIV finally broke the record on February 7th, 2010. 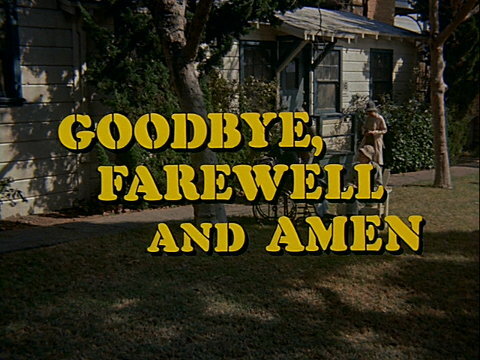 “Goodbye, Farewell and Amen” remains the single highest-rated television program of all time with a 60.2 Nielsen rating. For more, read my Goodbye, Farewell and Amen Ratings Analysis. CBS/Fox Video released “Goodbye, Farewell and Amen” on home video (VHS, LaserDisc, and CED) just weeks after it aired on television. CBS repeated “Goodbye, Farewell and Amen” twice after its original broadcast: first on Monday, September 19th, 1983 and again on Tuesday, September 18th, 1984. It didn’t air on TV again for a decade. FOX kept it out of syndication until February 1993, when it aired on stations across the country to celebrate the 10th anniversary of the end of the series. In May 2015, diginet MeTV aired a special three-hour presentation of “Goodbye, Farewell and Amen” with new interviews featuring the cast and crew of M*A*S*H. MeTV later uploaded the interviews to YouTube. I wrote about the ten interview segments last year. They’re well worth watching. Thanks for these episode recaps each week since 2013. I have enjoyed them. Monday’s will seem odd without these posts going forward. Oh man, finally the Episode Spotlight’s come to completion. What will I look forward to on Monday’s now! I knew they were almost done but thought we had another 8 or 9 to go. So first off, huge thanks and respect to RJ for typing up 251 of these bad boys! I agree the story is VERY poignant and memorable, and I guess Hawkeye was the best choice for the one to do it. I am, however, one of the people in the “Alda overacted the heck out of that” club. It’s a bit over the top. After all the horribleness he’s seen in war, this is the thing that puts him over the edge? Granted it’s horrifying, but just seemed a bit extreme. Charles storyline in this episode was always so poignant to me. I’ve always loved that Mozart piece just because of this episode. For those wondering, it’s Mozart’s Quintet for Clarinet and Strings (K. 581). There’s multiple versions of the piece, but the Allegro one is closest to what you hear in GFA IMO. The loss of all the musicians and Charles reaction to it and listening to classical music is devastating to me and David’s acting is superb as always. Klinger’s storyline was good. It was nice to see him finally happy with someone. I do wish we got a little bit of a hint of good news in the end for Soon-Lee’s search for her parents, but guess that comes in AfterMASH. Father Mulcahy’s storyline in the finale is the one that I’m the most unhappy with. I think it was completely unnecessary. I guess they couldn’t come up with anything better? Somehow? Him potentially losing his hearing is bad enough, but potentially losing his faith as well? That’s not in line with his character at all and just flat out wrong. Luckily they retcon both of those in AfterMASH. I agree Margaret got a bit shafted here. As one of the only 3 character’s who’s been there since the pilot, she deserved better. At the same time though, what were they really going to do with her? She already had the marriage thing, that didn’t work out. She’s always been an army brat, so I guess she just keeps on in the army. BJ’s storyline always kind of pissed me off a bit too at the end, mainly because he almost got to go home. I totally get wanting to be there for your daughters 2nd birthday, especially since you missed the first one, but dude, there are many people there who have been there way longer than you have. Pretty wrong of him to take advantage of a clear mistake like that, but then BJ always sucked so whatever. All in all though, like RJ, I’m mostly satisfied with the episode as a series finale. We always knew the end of the series would be the war ending and everyone going home, so there wasn’t any reason to waste a lot of time on the war stuff. The finale should have been and mostly was a focus on each character and how the war has changed them forever. One last note, that final GOODBYE written in rocks might be the most iconic fictional televised thing of all time. Seeing that is such a flood of emotion of ELEVEN years of TV. Even though the war was only 3 years, to me it seems like some of those guys were in that hell for 11 years, and there’s just so many great characters (Trapper, Blake, Charles, Radar, etc.) to think back on. Oh, one last..last thing. How great would it have been if Radar was still around for the finale? I may be biased since Radar is my favorite character, but I agree, I feel like GFA would have been a really interesting episode for him. I remember Alan saying that he wanted each of the characters to experience some kind of injury in the finale, whether physical, mental (Hawkeye’s breakdown), or emotional (Mulcahy’s hearing loss), so it makes me wonder what would have happened to Radar in GFA. He would be captured by North Koreans and tortured on the stretcher, which while physically injuring, would also have made him the tallest person in the camp! Honestly not sure how they could have handled Radar’s injury. I think he would be prime candidate for an emotional injury, similar to Charles, but not exactly sure how you’d do it. Wonder if they would have considered making Burgoff’s malformed hand a plot line point if he had stayed for GFA. I can’t believe Episode Spotlights are finished . . . I’m with both Crabapple Cove and 007’s sentiments that now there’s really nothing to look forward to on Mondays. I guess I just took it for granted that Mondays were always Episode Spotlight day without even giving any thought as to how long they’ve been going on, or how many were even left. I hadn’t even thought about how we’ve been doing this since the beginning of 2013 – that’s amazing. Even when I saw GFA was today’s spotlight, I didn’t even think this would be the last one, I just assumed it was another random choice as they all have been. Nevertheless, there’s . . . really not much more I can add to the discussion that hasn’t already been touched on, other than, fittingly, GFA is perhaps the episode that stirs up emotions in me more than any other (“Good-bye, Radar” and “Abyssinia, Henry” also get to me, but not as much as GFA). Okay, enough about that. The only problem I have with Charles is . . . even as everybody was departing, he still seemed condescending toward Hawkeye and B.J. – I guess he stuck to his word that he did not intend to become “chummy” with anyone in camp. Other than that, the thing that tugs at me the most about the finale is Hawkeye and B.J.’s final goodbye: I really, really hope that they were able to see each other again back in the states. B.J.’s last line, “I’ll see you back in the states; I promise!” chokes me up everytime. Agree with you there on Charles still being a bit condescending, but I think it was done with a bit of humor and understanding on his part. It would have been nice to see a little glimmer of him really accepting them as friends, but I think from what we’ve seen throughout the series, especially towards the end, such as in “As Time Goes By” that they really are friends. As much as I don’t like BJ, that part at the end is really emotional. You have to assume they saw each other in the states at the end, despite being about as far as they could possibly be from each other here. They were just too close of friends to let any distance keep them apart. Plus Hawkeye’s single and his dad was aging right. I figure at some point his dad passed away, and he was then able to go to San Francisco and just stay there with Beej, at least for a good while. And if it helps, in the novels, Hawkeye and Trapper meet up after the war and go on antics together for years. Alan Alda played the scene with him seeing the GOODBYE perfectly too. The complete and total flood of emotion that must hit upon seeing that. I can’t imagine and the way he played the part was perfection. I also can’t help but to imagine what it would have been like if Trapper had stayed. Imagine the end if Trapper had been there together with Hawkeye the entire time. Granted I don’t think Trapper would get as emotional as BJ, but it’d still be great to see. And hell while we’re at it, why can’t Blake, Frank and Radar be there too, yes even together with Potter, Charles, & BJ, all of them. Why, because that’s how I want it to be! Oh and also, after show Hawkeye hung out with BJ for awhile, he then went and hung out with Trapper for years, after slapping him of course for not leaving a better note. That’s how it goes down in my head anyways. RE: Charles. Did you notice that he NEVER shakes hands with BJ or Hawkeye? Men, whom he had shared at least two years (and seven tv seasons) with and he does not even give that customary courtesy. I get the feeling he is back to Boston General and his old aristocratic life. Order will be restored and the Boston Brahmin will be back in his perch. First off, major bummer about the end of the Monday episode reviews, but I’m glad the Monday discussions will continue, at least for a little while. As for GFA, not only is it my favorite series finale of all time, but I maintain it’s the BEST series finale of all time; I know some will disagree with that, and that’s fine, but no other finale knocks me out like this one does. One thing about final episodes that always irks me is how they often try to do “too much.” That is, every character is given a resolution/new direction of some sort. At first glance, GFA is guilty of that, except it’s the end of the Korean War, everyone is returning home, so the new directions are come by more naturally here. There’s a lot going on in this last M*A*S*H. Hawkeye’s breakdown, the fire and subsequent bug out, of course the end of the war, the tank & shelling of the camp, and all of the plots related to the main characters. However, I think it all works, though I could have done without the fire/bug out story line (though I understand it was a necessity due to real-life circumstances, and given that, they worked it in as well as can be expected). Despite all that, to me, the episode never feels overly-cluttered. It all just clicks. Hawkeye’s breakdown, yes he had some mental issues prior, but here, it truly shows how the war finally got to the chief character responsible for constantly escaping the madness – the one (supposedly) least likely to lose his sanity. After all of the horrors of the conflict, it’s just too much. In fact, this episode does a great job of getting the feelings of “waning days of the war” across. Everyone is tired, burnt out. The prior episode (the actual last one filmed) demonstrated this feeling as well. The final “Goodbye” scene, I feel, is as close to a perfect ending as any TV series has ever had. It’s sad, it’s sweet, it’s a goodbye in every sense of the word. “Iconic” is the perfect definition of it. Regarding the broadcast as a whole, in some television markets the first episode was aired directly before the finale, and the immediate differences between the two, to see just how MUCH the show changed over those 11 seasons, it must have been mind blowing. I never get tired of GFA. IMO, it’s a masterpiece. Great post. I agree with a lot of what you said. And it really strikes a chord, putting into perspective what I wanted to say in my own post, but couldn’t find the words. I do agree that they do a great job of giving the characters a sense of closure without making it feel like too much, or too fake. But I also love how they leave a lot of things open when it comes to that “closure.” Hawkeye seemed to be getting better towards the second half, but I’m sure his recovery wouldn’t be that simple. How much would his experience haunt him when he was back? Would it be such a traumatizing experience that he’d have trouble adjusting to normal life, or would it eventually fade into occasional nightmares, while he managed to deal with it most of the time. Was Charles really never able to regain his love for music, or would that trauma likewise fade over the years? How long would it take Klinger to find Soon Lee (if he ever did), and if he found them, would he go back to America or stay with her family in Korea? Could Mulcahy find his faith again through his work with the orphans, even if he never got his hearing back? Would Hawkeye and BJ meet up like BJ promised? Would all the things people mentioned at the farewell dinner come to pass the way they hoped it would? Stuff like that, the questions about life going forward, as they say goodbye to the people who’ve become so important to them, just seems so true, and so powerful to me. It’s easy (and fun) to imagine all the possibilities, but to have actual answers to those questions (or some of them), would take that away, which is a big part of the reason why I don’t like to think of AfterMASH as canon. First off, RJ, thank you for these incredible Episode Spotlights you wrote up every Monday. I was at the ranch this past week, and it’s incredible to see the site in person. It’s so much smaller than it looks on TV. There are just the burned out ambulance and a burned out jeep at the site along with a rudimentary mess tent set up and the signpost in the middle of it all. Reading this synopsis brought back to me how it must have all been back when they were filming this episode and the ranch went up in flames. Lucky! That’s on my bucket list of places to visit, but I’m on the other side of the country unfortunately. I can understand some people having certain issues with this episode, especially those who feel like it may have been overly dramatic for their tastes. However, it happens to be one of my favorite series finales of all time. Undoubtedly, its central stories were very dramatic, particularly Hawkeye’s and Charles’. However, watching it again this past summer, I couldn’t help noticing it had a little bit of everything I loved about MASH. There were nice bits of comedy sprinkled throughout, there was some great heavy drama, and some feel-good drama as well (most notably with Klinger’s wedding). And even more, while I definitely agree they could have given Margaret a more substantial role, I do feel like they did a great job servicing most of the cast we’ve grown to love, both as individuals and as a group. And yes, that farewell dinner scene was a great way to say goodbye to the characters as well, both the major an minor characters who made the show what it was. Honestly, if AfterMASH had been more easily accessible back when I first got into the show, I probably would have been dying to watch it, simply to watch more of the characters I grew to love on this show. However, now that I know that they’re on Youtube, I have no desire to watch it. Part of that is due to the notoriety the show has received, as well as the lack of a war-time setting (a huge part of what I love about MASH). But even more, I think that knowing what happens to the characters after this point would take away from what’s so great about this finale for me. I forgot to mention, out of everything in the finale, I have to say I loved Charles’ story the most, especially watching it this time. Though that may be in part due to the fact that I love his character, and he’s even grown to be my favorite character on the show. But I love how it played out: first being primarily comic relief, as he deals with the musicians, and then becoming a bit more serious as he realizes they’re being taken to a P.O.W. camp, showing how much he’s grown attached to them, and finally giving that gut-punch moment, when he finds out that they died. What makes it all even better (just like so many of Charles’ episodes, especially the dramatic ones) is David Ogden Stiers’ brilliant acting. How convenient was it that the musicians just happened to play the same Mozart song he was just listening to a moment before he went out to scold them about the music they were playing? It not really something that took away from the greatness of the story, but it did stick out to me when I watched it recently. I always took it as the musicians heard him playing that song and purposely played that one. Does anyone else besides me feel like crying now? I’m always a mess watching the last half hour of GFA. 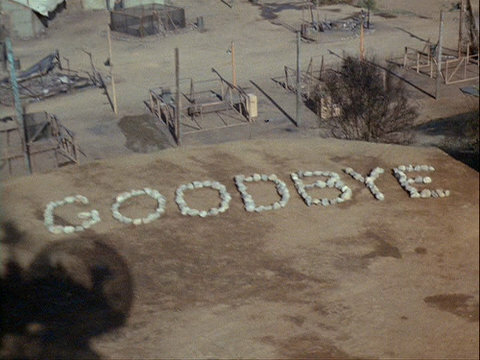 The tears intensify at the point where Hawkeye’s chopper is lifting off, and he sees the ‘GOODBYE’ spelled out in rocks. With the music playing, it’s the perfect farewell to both him and to us as an audience. The ending has never failed to move me no matter how many times I’ve seen it. The whole sequence with everyone departing the camp is pretty emotional. Always affects me a bit too. Kinda disappointed way back when I learned this was not the last episode filmed though. For some reason it seems to take away a bit from the emotions around the finale knowing that they still filmed 5 or 6 more episodes. At the same time, the last few minutes of “As Time Goes By” is EXTREMELY emotional to me for the same reasons, because that was the last stuff filmed. The scene with everyone burying the time capsule is the last thing filmed for MASH, and Hawkeye, BJ, and Charles walking towards the Officer’s Club with Charles mentioning Frank Burns is the last scene in that episode. Both are tough for me to watch. Margaret’s telegram to her “Uncle Bob” should’ve included one more line after “His two years here equals ten years any stateside hospital”. That line would be “Am asking you to request board reexamine Winchester resume”. The storyline with Charles and the Chinese musicians was brilliant especially when Charles tells them what he’s trying to do. 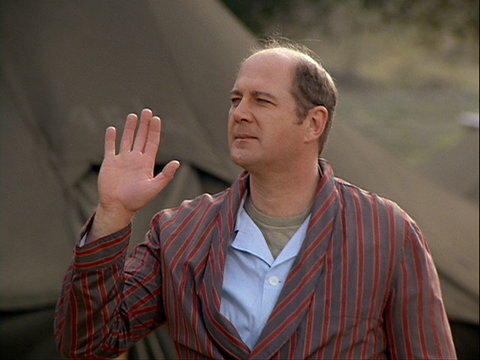 When Charles first encounters them, he mentions he’s ill, referencing David Ogden Stiers being diagnosed with Hepatitis. I believe Hawkeye’s breakdown was well-acted and left me goose-pimply. Klinger’s storyline was great and his announcement that he planned to stay in Korea and help Soon-Lee find her family was noble. When the truce was signed, the reactions were contrasted by Charles looking relieved while everyone else was ecstatic. The final goodbye between Hawkeye and BJ was very moving and I honestly believe they would see each other in the states. That’s my view of “Goodbye, Farewell, and Amen” and in the immortal words of Robert Pierpoint, “There it is, that’s the sound of peace”. I just found this site and I really appreciate the work RJ and all the commenters have put into it. I was 5 when M*A*S*H debuted and it has been a part of my life ever since. My old man was a big fan and he got me hooked at an early age. We didn’t have a VCR when GFA first aired, but I recorded the audio with a tape recorder. I still have the cassette! Later, in 1993, I recorded it with a VCR when it was shown on the local FOX station (including the “bumpers”). Unfortunately, I lived out in the sticks at the time and the video isn’t the best. Anyway, I’ve always felt that this was a great finale. It obviously didn’t have the lunacy of the early years, but there was a lot of subtle humor. And besides, in 1983 it was a must-watch “event”. 1. Hawkeye’s realization/breakdown with Sidney. 2. BJ’s early departure (the inability to say “Goodbye” to Hawkeye in the mental ward, the scene in the mess tent with his daughter’s picture, his quick goodbyes to Potter and Margaret), his subsequent return, and the scene with Hawkeye in the mess tent. 3. Winchester’s story arc (from his illness, to his sadness at the Chinese musicians leaving, to his horror at their deaths, to his melancholy speech at the party, to his reconciliation with Margaret, to his attempted noble departure from the camp). 4. Everything after the wedding scene. More specifically, the final scene between Potter, Hawkeye, and BJ is always where I start to tear up. Later, when the music starts playing as Hawkeye’s chopper is taking off, I tend to really lose it. 1. Potter doesn’t have much to do except to be the C.O. and father figure one last time, and comment on what retirement will be like. 2. Father Mulcahy’s story was good, but I’ve always felt that it was short-changed a bit. 3. Margaret’s story was not very interesting, aside from her attempts to help Charles get his job. She has plenty of shrill moments, which are annoying. However, she does have some touching scenes, especially near the end. 4. I like the Soon-Lee character, but I’ve never been convinced of her love for Klinger. But of course, the twist of Klinger staying in Korea is great. Just got done watching this, while pausing every few minutes to give out Halloween candy of course. The people coming to the door must have been wondering why this weirdo was answering the door with tears in his eyes. You know I’ve seen this probably half a dozen times now, and I always forget just how emotional it really is. Every characters departure starting with Klinger and on through BJ, Hawkeye, and Potter is just incredibly difficult to watch. Except Mulcahy though because he can’t hear anything. He has some nice closing lines, but it’s just awkward with him not being able to hear, and it’s really too bad it had to end like that with him. Potter’s face every time he holds back crying just destroys me. You should have incorporated your tears into a Halloween costume of some kind! The last 20 minutes or so really are powerful, even 30+ years later. Great stuff. You hit the nail on the head about what I said about Mulcahy’s story. That’s what I meant. And yes, Harry Morgan was a fantastic actor. I agree now that you mention it that Margaret isn’t given much to do, but I never really noticed so it’s probably ok. I hated Mulcahy going deaf, but they fix him later so it’s all good lol. Speaking of aftermash, I have seen a few episodes and I think the first one at least is pretty good. The series definitely gets less watchable as it goes but I recommend the first episode if you’ve never seen it. Thanks for doing these, they were good. Well, there was a moment where Mulcahy is praying, and he says to the Lord something to the effect, “Everyday I pray for you to help me, but everyday I only get worse . . . are You deaf too?” I don’t think it’s so much Mulcahy lost his faith as it is he had a lapse in it, or felt some spiritual doubt, and I think even some of the more devout of Christians go through spells like that. Seeing what’s been happening in the country all year makes me feel like God is on vacation right now, because I haven’t felt like He’s answered any prayers in months . . . and certainly, more recently, my mom messed up her knee really badly – this happened over two months ago, and she’s only recently finally starting to improve, but it was a nightmare situation trying to get people to see her and for her to get some medication for the pain; everyday she begged the Lord to ease her pain, but it wouldn’t go away, and she was on the verge of suicide because she couldn’t stand suffering anymore, and she’s one of the most godliest people I know, so that has to tell you something when even she felt like the Lord wasn’t listening to her. First off, I’m glad your mom is starting to improve and I’ll pray for her continued recovery. I agree with your earlier statements, I’m a devout Christian and I have experienced those “lapses” in faith you have described before and I think it’s natural. It’s just devastating to see it in a character or person you love. I think we’ve all experienced those “lapses”, for sure. But, the first chapter of the book of James (one of my favorite books of the Bible) helps with that. Just keep in mind that God is still here, it’s just us humans, who have the gift of free will, that screwed things up. He wants us to trust Him for all things (Proverbs 3:5-6). So, as for this episode and the ending of the Episode Spotlights….First of all – RJ. Dude, you deserve a medal of some kind. The time, determination and energy it took these last five years…..Wow. As the others have said, this was something so many of us looked forward to to start our weeks and is something that I will certainly miss. As for the episode – there isn’t anything I can add that hasn’t already been said by you all. I think you all have hit the nail on the head. I really like this episode….but, do not like to watch it at all. I end up a total emotional mess at the end, even moreso than Henry’s and Radar’s last episodes. I am a guy going on 50 and still can never keep the waterworks from going haywire. I absolutely love classical music (I’m a classically trained violinist and pianist) and this type of music really soothes me as it does Charles. So, what it took to have him change his mind on that….? Powerful, tragic. And lastly, I know it’s been said before somewhere and is something I agree with, that BJ spelling out “Goodbye” was the show’s way of saying goodbye to its fans and viewers. Totally awesome finale to a totally awesome show. RJ – please keep up the fantastic work you’ve been doing…..We are looking forward to what you have in store for the future of this site. I had to miss all the special airings in the past few years and the entire show got the boot from Netflix at some point I didn’t know about so I’ve never seen GFA. Anyone know of a good place to find it? 1) Minor nitpick: There is no way in God’s green earth that Sydney would have been allowed to treat Hawkeye! He was too close to the man for him to be objective as a therapist. It was a good way to say goodbye to a great supporting character but it was out of character, as Sydney himself would not have done this. Did we ever find out what happened with Soon Lee’s parents? She and Klinger went back to the States together in After Mash, but as near as I can remember we never saw her parents. BJ accidentally getting sent home felt kind of contrived; would Potter have really let him go even though Klinger got the correct orders? Charles and the musicians was probably the saddest part after Hawkeye’s breakdown. 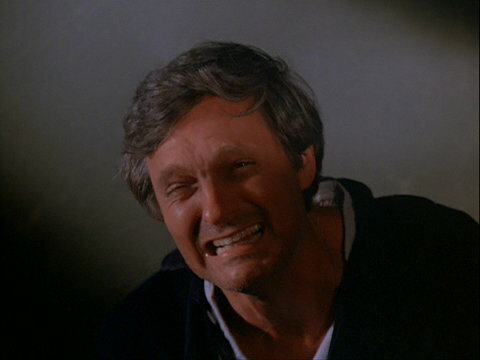 And yes, Alan Alda’s acting was pure emoting, but it worked. Radar sort of had his own trauma in the pilot for WALTER, where he appeared to be considering overdosing on sleeping pills. Going back and forth between tears of empathy and tears of joy for the people on screen was an emotional rollercoaster that I very much enjoyed. Loved seeing David Stiers get to conduct a mini orchestra. He’s an accomplished conductor in real life so I liked the overlap into real life. Not sure where he found an actual conductor’s baton in Korea. Maybe the actual one that he used? His “Oh God no” when he sees the musician dead brings me to tears every time. I think he wasn’t very emotional when he said goodbye because he was still in shock over the musicians dying and what that did to his love for music. He nearly got out of there relatively unscathed but at the last minute everything changed. That’s what I took from the way Stiers played it. This viewing Soon-Li seemed very pushy and entitled. When Potter wouldn’t let her have the Jeep, she had this confused look on her face like, “but I should get whatever I want because I’m dating the company clerk.” All she did was interrupt everyone with her demands about her family. She was ungrateful and didn’t realize how lucky she was to have Klinger helping her. Then she just leaves without a word and gets angry when he shows up to help? I also never believed she loved him and was probably just using him. Klinger was so naive about woman he would fall for anything. Also there was nothing romantic about a 55 year old man falling in love with a 22 year old woman. The Hawkeye story line was only fitting. He had been slowly losing his mind for awhile so it had to culminate in him being committed. It surprised me that Marg was actually considering leaving nursing for an admin post just to get promoted. The army was important to her but so was nursing. Besides, what would a female colonel do in the army but nursing? Sit at a desk doing paperwork? They’re certainly not going to have her leading troops at that point in history. Why was Father Mulcahy wearing a doctor’s coat when he ran out to rescue the POWs? Although he did help in the OR sometimes he was certainly not a nurse or doctor (even if he thought was sometimes). It was almost comical how far away from the bomb he was and yet he reacted like he had been shot out of a cannon and even lost consciousness. Also, remember when the sisters at the orphanage used to come and pick up food and supplies themselves? Once he leaves, they will still be orphans. I really hated the way BJ reacted when Hawk started ranting about being locked up. BJ immediately ran for Sidney. Hawkeye was understandably upset and was venting. I think it’s scarier that nobody else was that upset that a woman murdered her baby right in front of them. You would think BJ would be very upset being a father. That always bothered me even as a kid watching the first time. That’s supposed to be his friend and BJ reacted like he was looking at a crazed stranger on the street. Why did Potter think that BJ would even make it home once his travel orders were rescinded? I’m pretty sure they have lists at all the places he would have to go through and someone would have stopped him (and did). After they heard the truce had been signed and the war would be ending soon, they got trucks with wounded and Margaret said , “does this look like peace to you?” No it doesn’t and it shouldn’t because the war hadn’t ended yet. Was just too heavy handed with the anti-war drama for my taste. BJ saying he wanted a big glass of cold milk. Why doesn’t he just get some from the mess tent? They’ve had milk all along both real and powdered. His acting at the end when they were saying what they would do when they got home was so bad. The fake nervous laughter and his bizarre story about running off with some “cookie.” It didn’t make any sense even as a joke. Nor did his crying when he was saying goodbye to Hawkeye seem sincere. Alongside Alda’s amazing acting Farrell just didn’t have it in him. It must be noted he wanted fresh ice cold milk suggesting the milk on hand wasn’t really fresh. Also, I have to wonder why Charles was so bullheaded about his dream job in Boston, especially what his colleagues there would say about how he got the job with help from Margaret. Was he concerned that they’d ridicule him for enlisting a nurse’s help? One last thing, does anyone know how many episodes were referenced in this episode? I love Max as a romantic lead. He’s bold, heroic and empathetic.